TMK Air Commuter DHC8 CFOVR, originally uploaded by $and$man. TMK Air Commuter (Goma) is getting ready to take delivery of its first Bombardier DHC-8-100. Copyright Photo: Chris Sands. Waiting for its delivery flight at Calgary, ex Regional 1 DHC-8-102 C-FOVR (msn 105) is now fully painted in the colors of TMK Air Commuter. 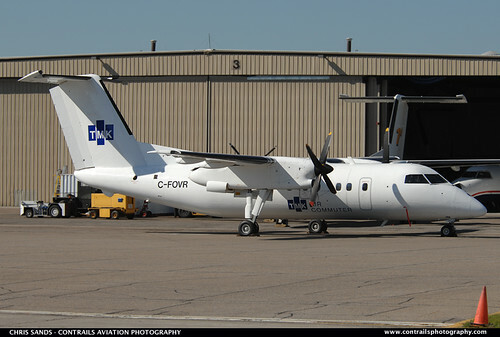 This entry was posted in TMK Air Commuter and tagged 105, Bombardier, Bombardier DHC-8, Bombardier DHC-8-100, C-FOVR, Calgary, Chris Sands, DHC-8, DHC-8-100, DHC-8-102, New Type for an Airline, TMK Air Commuter, YYC on July 22, 2010 by Bruce Drum.